Eataly feels European in the sense that B&B Ristorante in Las Vegas feels like Babbo. It’s a good approximation (I enjoyed my food), but something is noticeably lost in the translation. The strange layout of the place, the unfinished floors (whether their unfinishedness is intentional is anyone’s guess), and through no fault of the management, the people who work there are just not the same. In Italy, people who work in markets look like they enjoy their jobs, or at least seem to understand why their jobs exist and the value they serve. At Eataly, well, they’re a bunch of New Yorkers working at a place where no one sees it as a career and most see it as an obstacle to their “real” careers. This is not distinct to Eataly, this is true wherever you have young employees working for an hourly rate doing anything remotely requiring customer service. My experience at Eataly was that anyone who was Hispanic had a work ethic (I’m including the two ladies at the bizarre restaurant check-in booth) and anyone else, minus the cooks, were confused, inexperienced, or clock-watching (I’m including all five or more employees at the coffee place). The amazing thing is, despite my overall lukewarm impression with Eataly’s atmosphere, I might go back for another meal at Il Pesce. Its quality doesn’t seem to jive with its surroundings (the converse of Il Pesce in Eataly is a StarKist salesman in the Tsukiji fish market in Tokyo), though its informality does and that’s a good thing. Let me clarify: the informality of the presentations jives with the surroundings, if not all the prices. You just need to know in advance what to order. In this regard, I’ll try to help. If you see a razor clam special, grab it immediately. An absolute knock-out. These particular clams had so much meat that your expectation is that there’s no possible way they are at all tender. The opposite was true. Simply but deliciously prepared, and I would get them again in a second. 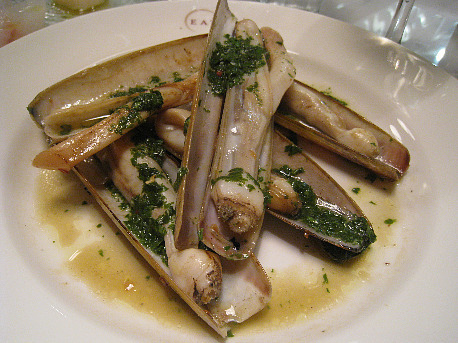 Dare I say, razor clams as good as in Barcelona? I dare. Curiously enough on the menu was a “smoked fish of the day”. That called for an order, regardless of the day’s fish. For $15.00 a plate, it’s quite a let-down to get salmon. 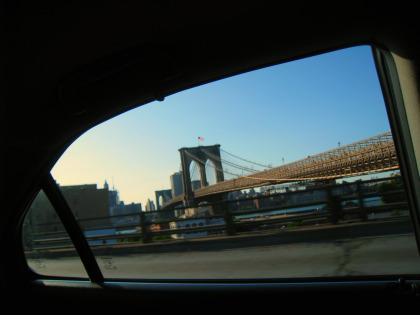 I could go to a decent bagel shop, ask for the thinnest slices, and drizzle on some decent olive oil and be happy. But $15.00 for this, under the bright lights of a department store, borders on insulting. 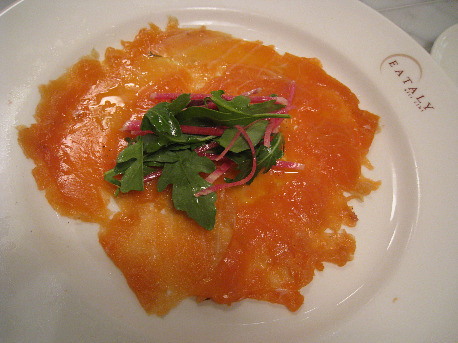 $15 smoked salmon. Good, but not that good. I should say something about the olive oil, however. It was drizzled on everything, and always appreciated. I wish I knew the rhyme or reason behind why one oil was picked over the other half-dozen selections, but whatever it was, the chef knew what he was doing. Fortunately for us, one of those inexperienced people I mentioned earlier comped us an appetizer because he got our order wrong. Instead of oysters, he served us the crudo. And this was fortunate not just because the oysters would have been too much food, but it saved us from having to spend $19 on four pieces of sashimi. This was an insult. Or would have been had we spent it. If this weren't comped, we would have paid $19. Actually, no we wouldn't have. 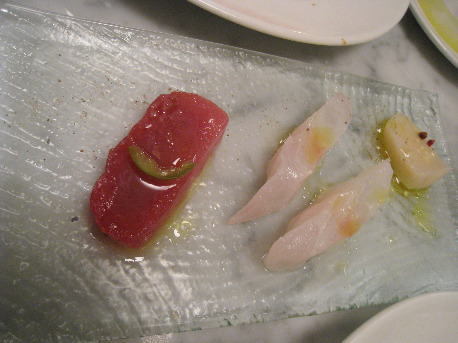 The tuna was sushi take-out standard, and though the other fish was better, none of this was on the standard of Esca, where Il Pesce’s chef David Pasternack originates. At Esca, the crudo has repeatedly blown me away. I sense the technique here is up to par, with olive oil and textured salt placed lightly with a subtle hand, but unfortunately they’re on top of pieces of fish that come straight out of a cold refrigerator. If it’s not clear already, pass on the crudo unless you have money to burn. $5 carrots like this, I can live with. 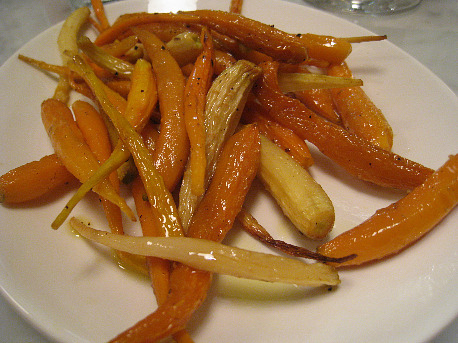 The yellow and orange baby carrots were as delicious as they were beautiful. Slightly chewy, which is not the texture I necessarily associate with good carrots, but a very worthy side dish to the main course. For our main course, we had ordered the intriguing sounding Sicilian style shark, but since the shark was sold-out, we went with a dish we watched being dished out in front of us on the other side of the bar. (That would be known as the kitchen, a closet-sized space in which four cooks managed not to step on each other’s toes.) 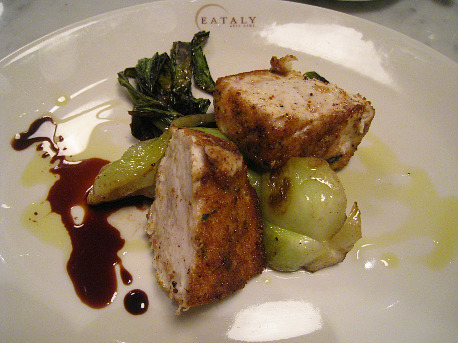 The dish was swordfish with bok choy, a good value at $21. This entree was on par with the razor clams. Perfectly cooked, lightly breaded, and drizzled with more oil olive and a little aged balsamic. Some baby bok choy was cooked a la plancha, caramelized in a way I’ve never had before and which strongly encourages me to try this technique at home. All these dishes mentioned were shared by two people, along with a bottle of white wine reasonably priced in the mid-30s. Overall: mixed. 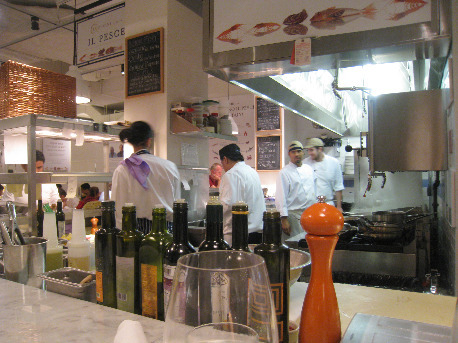 With a stop at Il Pesce, though, Eataly is worth checking out. Though it did remind me of a glorified Bed, Bath & Beyond, this is America, after all. If this is as close as we can get to Italy, and I happen to be near the Flatiron, I’ll take it. I disagree; for example they could have made it like Mondadori, in Milan on the square with the Domo. The food is more like fast food and there are never enough seats at peak hours. There are two Italys, one old with tiled floors, round iron tables. The other one is hi-tech, and that one is the one now being copied in the US.